Alarming statistics indicate that, as you read this short sentence, a woman has become the victim of assault. According to the Partnership Against Domestic Violence, every 9 seconds, another woman in the U.S. is beaten. It’s a sobering reality for one in four women in the U.S. will experience domestic violence in their lifetime, most frequently by someone they know. Female victims most commonly first experience domestic violence between the ages of 18-24 (38.6%), followed by age 11-17 (22.4%), age 35-44 (6.8%) and age 45+ (2.5%). Almost one out of five or 16.3% of murder victims in the U.S. were killed by an intimate partner; women account for two out of three murder victims killed by an intimate partner. Violence against women occurs predominantly behind closed doors at home with most cases having never been reported to police. But that doesn’t mean the problem isn't visible and doesn't spill into future generations. Domestic violence is the third leading cause of homelessness among families with 50% of all women who are homeless reporting that domestic violence was the immediate cause of their homelessness, according to The National Center on Family Homelessness. The risk of perpetrating intimate partner violence as an adult is two times greater for those who were abused or witnessed their mother being abused during their own childhood. Likewise, the risk of becoming a victim of domestic violence as a teen or adult is greatly increased when young people are raised in households where abuse is present. While domestic violence happens to people in all walks of life regardless of age, gender, sexual orientation, race, religion, education, profession or socioeconomic status, there are statistical predictive indicators of domestic violence, probably the most important being exposure to it as a child. More statistics on domestic violence. Fortunately, there are thousands of programs across the U.S. and Canada that can help and many of them report their service data to this website. 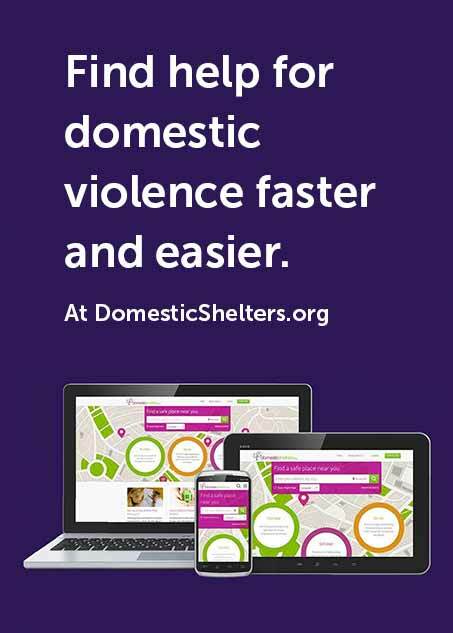 The trove of useful information includes state-by-state and national domestic violence shelter budget and spending data and rankings, as well as availability of types of domestic violence shelter services by state and nationally including domestic violence shelter pet services, people served by domestic violence shelters annually, domestic violence shelter funding source data and domestic violence shelter turn-away data. You can also find a summary of domestic violence services for each state and province, including links to the hundreds of cities that contain at least one domestic violence program with links to each and every domestic violence program. There are also quite a few surveys of domestic violence survivors that have been conducted, the results of which can be helpful in seeing firsthand the opinions of those who have been abused across a wide variety of topics.